When it does, one question is bound to resurface: Does Councilman Scott Sherman have a conflict of interest because his father has extensive residential real estate holdings in the city? In December, the city’s Ethics Commission received a complaint alleging Sherman had a conflict of interest. Two residents filed similar complaints this month with the state’s Fair Political Practices Commission, accusing Sherman of violating California’s conflict of interest law. Neither agency found evidence of a conflict that would warrant an investigation, but that hasn’t stopped Save San Diego Neighborhoods, an advocacy group opposed to short-term residential rentals, from raising the issue. In its April newsletter, the group urged people to contact the FPPC, the state attorney general, the county district attorney and the county grand jury to ask for an investigation into whether Sherman has a conflict. The group also shared on social media this month its position that there was a “cover-up” by the Ethics Commission not to investigate Sherman. Sherman, who declined requests to be interviewed for this story, co-authored one of the more permissive proposals for regulating short-term rentals that the City Council considered at a Dec. 12 meeting. The meeting ended after more than 10 hours with the council failing to pass any new rules. Blake Herrschaft, chairman of the Ocean Beach Planning Board, said the allegation of a conflict is fueled by Sherman’s father owning property that could increase in value if short-term rentals become more common. Because Sherman and his father have been business partners, the councilman could stand to inherit the properties, Herrschaft said. “This false accusation is based solely on hypotheticals alone and provided no proof of any violations whatsoever,” Powell said. 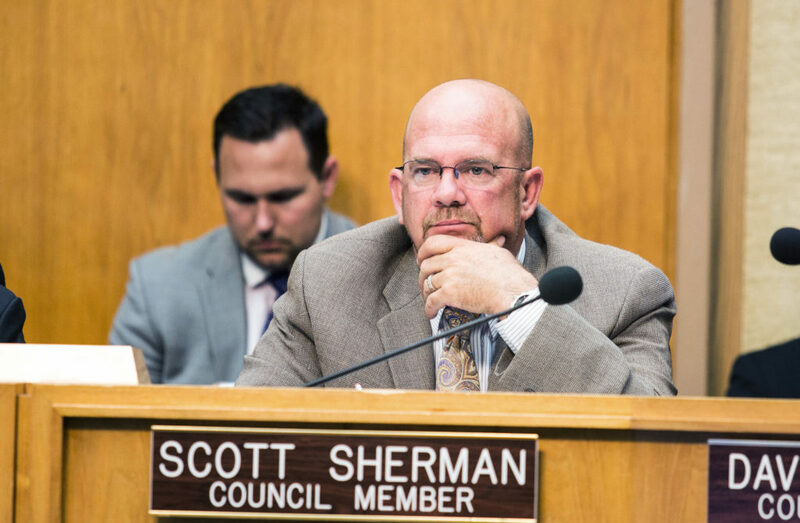 John Thickstun, an attorney and a Save San Diego Neighborhoods board member, said he wants Sherman to recuse himself, even if he’s not legally required to do so. “It’s a conflict of interest, even if it’s not an ethics violation,” Thickstun said. The law is the floor for what is considered a conflict of interest and for deciding when council members should recuse themselves, he said. What property does Sherman’s dad own in San Diego? inewsource independently searched San Diego County property records and found the councilman’s father, George Sherman, his trust or one of his companies own nine residential parcels in the city of San Diego, including apartment complexes and the house where he lives. The three apartment buildings Sherman’s father has an interest in have 33 rental units. All are in or near Ocean Beach, a prime neighborhood for short-term rentals. But none of his properties showed up in a recent Airbnb search, including ones where he or his trusts have an interest in La Mesa, National City and unincorporated parts of the county. Scott Sherman, for his part, only owns the house where he lives in Allied Gardens, according to county property records. Does Scott Sherman have a business relationship with his father? For years, Scott Sherman worked for and partially owned an insurance company started by his father. Sherman told KPBS in 2015 he started working at his father’s company, 5th Avenue Insurance, as an independent contractor. He was making more than $100,000 as an insurance agent and owned at least $100,000 in 5th Avenue Insurance stock, according to his publicly filed economic interest disclosure statements. Then, in June 2016, a local insurance company purchased 5th Avenue Insurance, ending Sherman’s only business connection with his father. Sherman is still an agent for the company that purchased 5th Avenue Insurance. Is a family connection enough for a conflict of interest? Robert Stern, an ethics expert who co-wrote California’s Political Reform Act, said Sherman didn’t violate the state’s conflict of interest law by not disclosing his father’s real estate holdings. The law only applies to the official, his or her spouse and their dependent children. Even requiring elected officials to disclose properties or business interests outside of that immediate family “would be just way too burdensome,” he said. Stacey Fulhorst, the San Diego Ethics Commission’s executive director, said the city’s conflict of interest rule also only applies to the elected official’s immediate family, which does not include parents. In a letter to Sherman, Fulhorst said she decided not to investigate the complaint filed against him because the allegation was based primarily on the potential for Sherman to acquire his father’s properties in the future. “The Commission does not have jurisdiction over complaints based on speculation,” Fulhorst wrote.